I didn't catch that you were had ordered his dress shirt with a pocket. I agree, the pocket should go. I wouldn't always count on a tailor, because some will just make whatever you would like. Yes, taking your suits and ties to the tailor is very good idea for matching items, but it's not always going to be practical if you're just out shopping or another city to have items on hand. You can always take pictures of what he currently has in his wardrobe. So if you do see something you can see if it might match color and material wise with what he has. You might not know for sure until you get home. I agree with not purchasing a shirt or any other garment in a vacuum. I'm pretty familiar with what's in my husband's closet and don't like to purchase a piece unless, I know it will go with something he already has, or we're getting him something that will go with a new piece that he really likes. It helps that he doesn't mind shopping and is open to trying something new here and there. My husband hates shopping - it is absolute torture for him. We did take 4 suit jackets to the fitting. I did not take ties because he has many ties, so thought we'd find something that works or just buy new ties to match. Plus, his 1st shirt is just a basic blue. I like your idea of taking photos of his wardrobe. My husband had always wanted a few custom made shirts, ever though off the rack shirts fit him quite well. He is now retired and rarely needs to dress up. Without my knowledge he spent $800 on custom made shirts this summer. Hubby gained five pounds and they do not fit. I just wanted to point out that your husband needs to keep the exact same shape unless you want to buy more shirts. I haven't seen the different kinds of shirt collars discussed yet. I'm partial to spread collars myself due to my oval shaped narrow head. Each collar has its place. What's wrong with off the rack clothes? Nothing, in principle. In practice, they don't fit a LOT of men correctly. 1) Get a shirt that fits my body, but be unable to button the collar (or wear ties, and that's non-negotiable for me...I love ties). Even a collar spreader wouldn't save me. 2) Get a shirt that fits my neck, but I'd be swimming in it, like I'm a little kid that wore his dad's shirt. That doesn't even touch arm length, but it's less of a factor. When you are shaped like a "pear", no "off the rack" dress shirt will fit properly. It will either be too tight at the waist or it will hang off the shoulders and you will look like a kid wearing your dad's shirt. I want to help my hubby improve his wardrobe, but he hates shopping. We are starting with dress shirts, which he usually buys off the rack at Nordstrom/Macy's, etc. So yesterday I took him to a tailor that makes men's custom shirts. There were so many choices - shirt cut, material type/weight/color, print, collar type, collar lining, sleeve cut, button type/#/material, cuff type/button, placat, pocket #/cut, # of seams, etc. So many choices! We chose a basic light blue with subtle stripe, harringbone basket weave cotton, standard curve collar, 1 sq pocket, 1 pearl button cuff... I had the collar lined with white herringbone material. I am really confused about all these shirt options! My hubby wants me to help him pick everything out. Now that the tailor has his measurements, I would like to periodically order more shirts - slowly replace his existing dress shirts with a custom shirt collection. 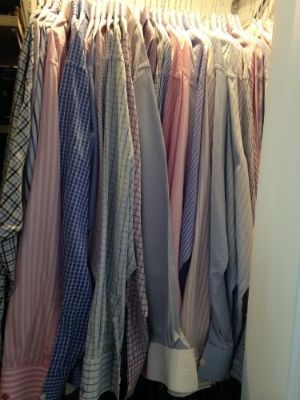 Any recommendations on the type of shirts that should make up his collection? I think he wants to move away from the basic white, blue dress shirt and be more stylish (but not too crazy!). Know of a good web site we can look at for ideas? I bought custom made shirts for years and never felt a need to buy any colors other than light blue and white, and eventually ended up with all button down collars. I would only go with other colors if he is looking for a more casual dress style shirt. A white or light blue shirt will go with every suit and tie combination. Some others have already touched on this but my issue is I'm tall with an athletic build. Many off the rack shirts are not long enough for me. I can't buy clothes at a big & tall man's store since I'm tall but only about 220 lbs. Off the rack shirts that fit my neck size are made for guys with a much larger waist size than what I have. I highly doubt your husband only gained five pounds. The first place a shirt will get tight is in the neck. I experienced this when I couldn't button any of my top buttons after I started lifting weights. My neck size increased an inch in a few months. The rest of the shirt should not fit that snug that a gain of 10-15 pounds will make a difference. For my husband, if it's a button down, it's custom. Off the rack just does not work on him. I believe he does convertible cuffs with a monogram for his dress shirts and standard cuffs w/no monogram for casual button downs. There's also a distinct difference in fabrics for his dress shirts which can't be seen in a photo. I tend to request that he have some pinks and lavenders made for his dress shirts because I feel they flatter his coloring. I soooo wish I could pick out some fabrics for his shirts, but being that he always has them made when he's overseas, I have to leave it in his hands. These are this year's shirts. Unfortunately they're not separated by dress and casual. However, I do get to pick out and buy the ties. I tend to favor Brioni, Kiton, Hermes, Canali and Charvet. Ctshirts is where I get my dress shirts in extra slim fit, button cuff, no pocket and spread collar. Wait for the shirts to go on sale and pick them up between 30-40.00 per shirt. Extra slim fit is pretty slim, they also have slim fit. I switched from brooks brothers slim fit because even those were baggy.